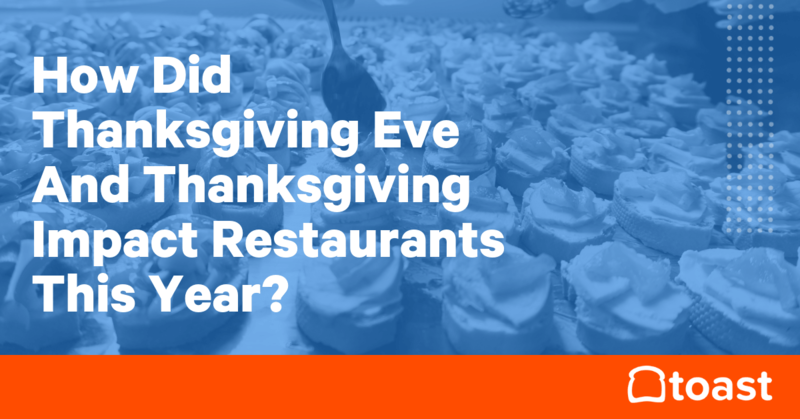 How Did Thanksgiving Eve and Thanksgiving Impact Restaurants in 2018? Turkeys, mashed potatoes, veggie casseroles — Thanksgiving is a day centered on food. Thanksgiving Eve, on the other hand, is a day centered on drinks and parties, and often one of the biggest revenue days for bars and restaurants, second only to Superbowl Sunday. Thanksgiving Eve and Thanksgiving passed a week ago, but restaurants are now learning from last week and thinking about how to optimize their operations — or close shop — for upcoming holidays like Christmas and New Year’s Eve. 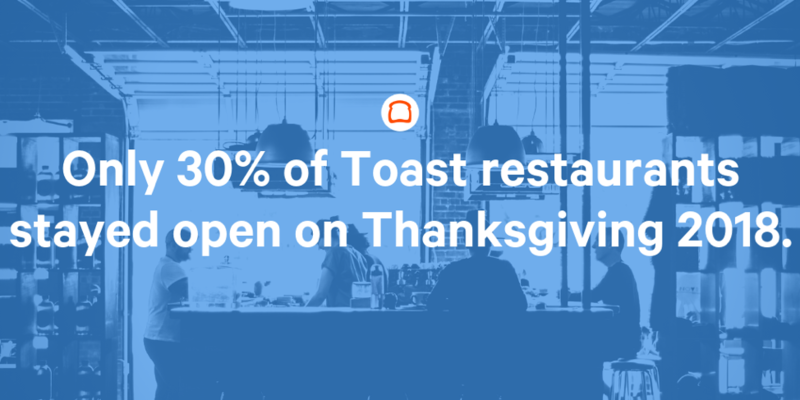 With exclusive data from Toast restaurants, we share how restaurants and bars fared this year during Thanksgiving Eve and Thanksgiving, as well as some tips on how to prepare for other upcoming holidays. Brace Yourselves: The Holidays Are Upon Us. Is Your Restaurant Prepared? 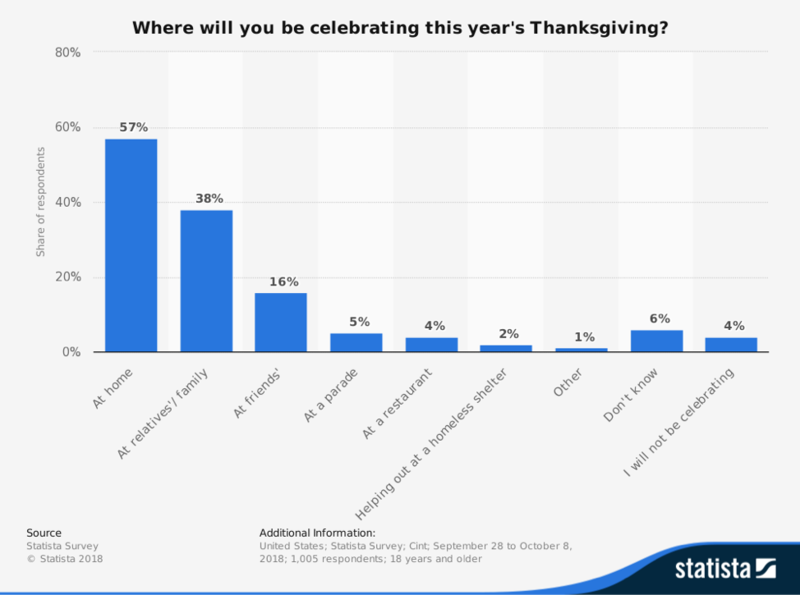 Was your restaurant well-staffed on Thanksgiving Eve? Many restaurants and bars staff up for Thanksgiving Eve – otherwise known as Blackout Wednesday, one of the biggest party days of the year. Many travelers are home for the holiday, and rather than cook the day before Thanksgiving — an all-day cooking bonanza — they venture to local bars and restaurants. The data proves it. 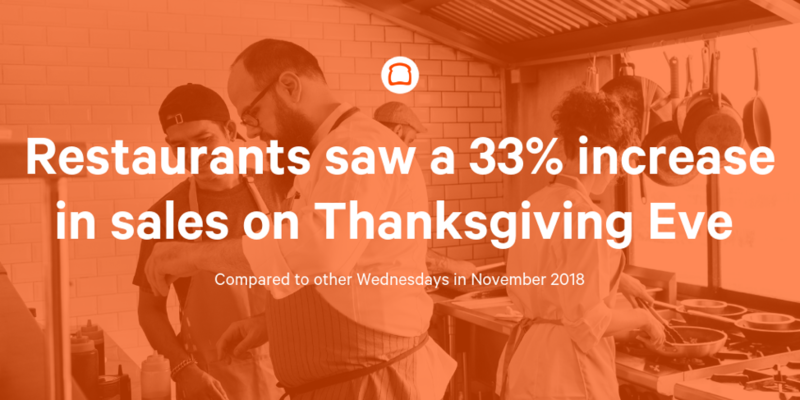 Toast restaurants saw a 33% increase in sales on Thanksgiving Eve compared to other Wednesdays in November 2018. Last year, we asked restaurant professionals how they prepare for one of the busiest days of the year on Facebook and LinkedIn and shared their responses. Many stocked up on inventory, staffed smartly in advance, and kept employees happy by hosting a party for staff. Park and Oak in West Hartford, Connecticut shared that they stayed open on Thanksgiving Eve and started a happy hour at 4 p.m.
On Thanksgiving Day, only 30% of Toast restaurants stayed open in 2018. According to a 2018 Statista Survey, only 4% of respondents answered that they would spend Thanksgiving at a restaurant. 57% answered that they would spend the holiday at home. There are some pros and cons to staying open on Thanksgiving. Pros: You may be in a position to make a lot of money, especially if you have a prix fixe Thanksgiving dinner menu with all the fixings. Cons: You will be keeping staff from their families, and you’re gambling the day on a hope that your restaurant will have traffic. The Black Rose in Boston, Mass. 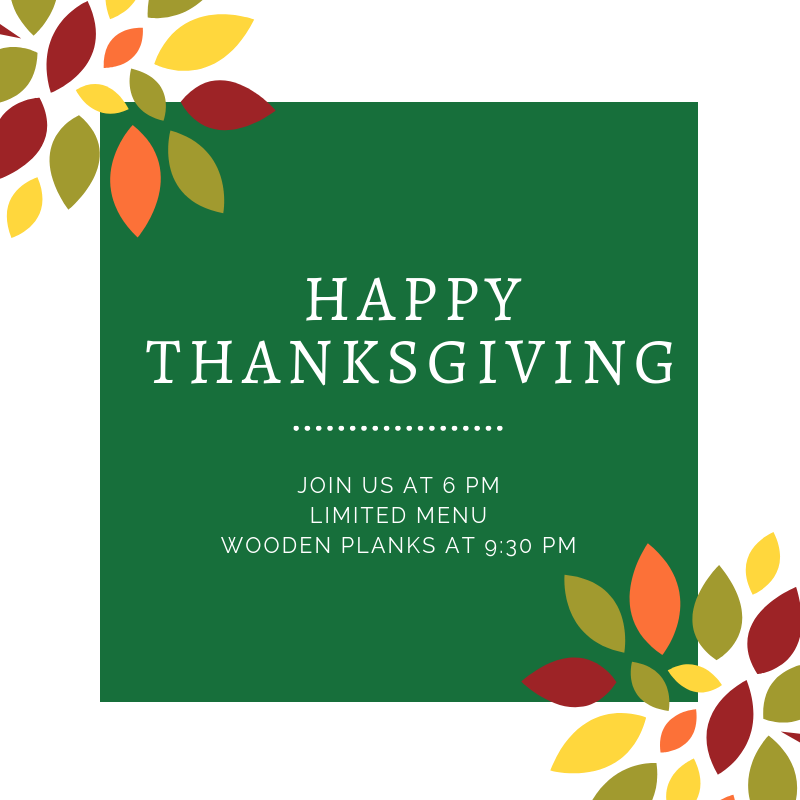 decided to open at 6 p.m. on Thanksgiving with a limited menu and live music. Their main message: join us after your mid-day nap! Christmas, Hanukkah, and New Year’s Eve are right around the corner. How will your restaurant prepare? Here are some tips. 1. Look at sales from last year and make smart, data-driven purchasing decisions. Inventory is so important during these holidays. Use historical data from last year - if it’s accessible via your restaurant POS system - to determine which menu items will be most popular. If more people are ordering appetizers than entrees, it might be good to double down on those nachos and cheese. 2. Be empathetic when creating your staff schedule. Many restaurants handle holiday schedules in different ways. It’s most important to staff empathetically, understanding that many staff members will want to spend holidays with their families. Some restaurants give employees the option to choose between working Thanksgiving, Christmas, New Year’s Eve, and New Year’s Day, requiring employees to work two of them. Others reward employees with double time as well as a bottle of wine to go home at the end of the shift. 7shifts, HotSchedules, and other scheduling platforms can help you with your holiday schedule. 3. Create a special menu for the holiday. Chefs, this is the time to be creative with a holiday menu. It can be prix fixe, or seasonal. Consider offering restaurant specials, discounts, or promotions at this time as well. Also consider starting to spread the word about a holiday catering menu. Allow customers to order ahead for their upcoming office holiday party, like Owl House in Rochester, New York. Head to the link in our bio to check out our holiday catering menu. It’s guaranteed to have options the entire party planning committee can agree on. Yes, even Angela. 4. Plan to take reservations. During the holidays, many customers will call to make a reservation, or expect to be able to use a platform like OpenTable or Reso to do so. Make sure your full-service restaurant is equipped to take reservations, and have strict reservation policies regarding if a table opens up. 5. Start promoting gift card sales now. Gift card sales skyrocket in November and December. 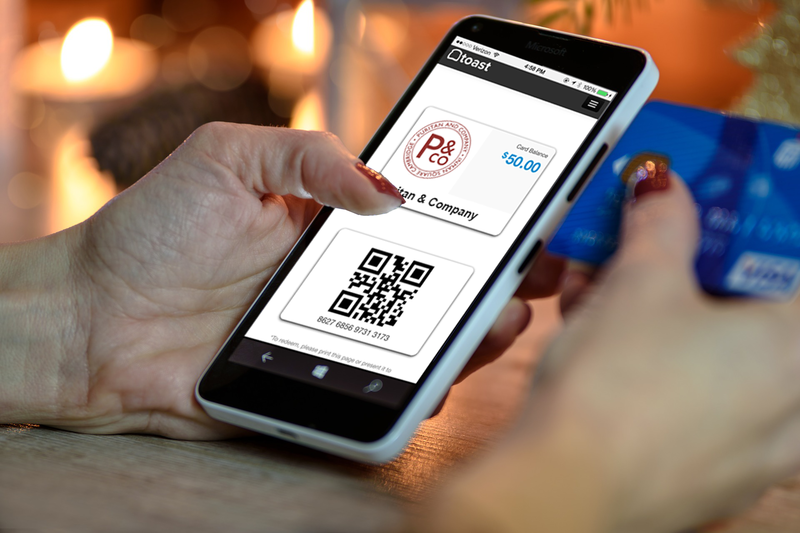 Make sure your restaurant is equipped to sell physical and/or digital gift cards. Plus, track how your gift card sales compare to credit and cash sales within your POS system analytics. How Was Your Restaurant’s Thanksgiving and Thanksgiving Eve? Did you experience a hike in sales on Thanksgiving Eve? Were you staffed for Thanksgiving, or did you give employees the day off? How are you preparing for Christmas and New Year’s Eve at your restaurant? Share your stories and tips for handling the holiday madness below!